Discussion in 'Rants and Accomplishments' started by tanpopo, Aug 21, 2017. What's your plan? I rolled with the Anubis/Ilmina + full board changers. Placed at ~4% after several runs, but I'm sure it will drop. Ilm and Leilan boards, swipe and pray. Gotta get that RNG crown, show everyone how good I am. Dremaza, Snarf and Murdurus like this. 145,152 score good for 2.1% atm. Ilm x4, Saria, Ilmina. I have no problem with an rng crown for an rng team in an rng game. BurningMan and Reine like this. Used Anubis/RHaku x 4/Diablos, got 11% after 2 tries, and I'm done. Just want the 10k MP. How high, percentage-wise do you need to be to have confidence that you will not drop much? Despite going into it not realizing the Tamadrapurin active was overkill meaning I wasted a floor manually matching existing light orbs instead of a board change swipe, I still hit 6.5% on the first try. Ranking dungeons are pretty stupid. Fixed team or GTFO. Wait a little and see, but probably expect to drop ~5%. Was at 18% from first run,(after first round of bans rolled out). Switched from pure combo, and focused more on speed to jump to 8.5%. Thanks...I'll probably try to get a little higher yet...just to see if I can manage...I'm only about 20,000-25,000 off of some of the others that posted so far. Best so far. Probably won't get any higher than this unless I start going stone crazy and get some good luck on my side. I tried the casino method a couple times and it is not kind to me. 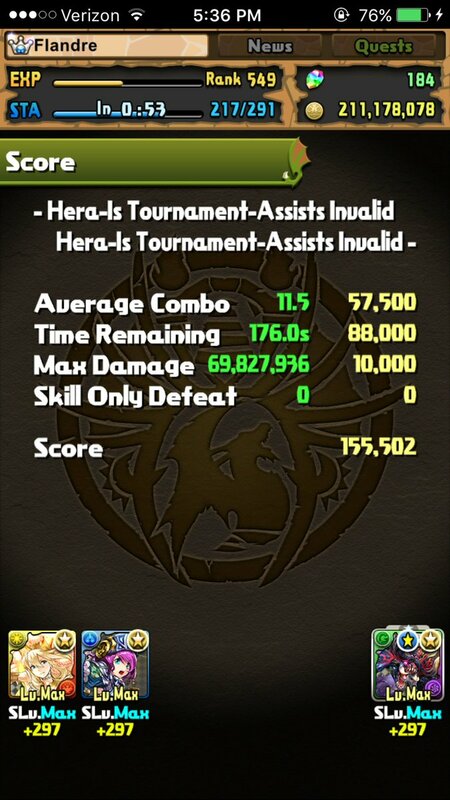 Got a solid 3 combo on Hera lol. Just gonna stick to matching what I can quickly then moving on and hoping for a few lucky skyfalls. I was at 15.6% last night with 133k. Checked today to see how far id fallen and im....8.8%? First try got 2.9%. Having 3 Ilms and Ilmina makes this pretty easy. I actually comboed out the boards and had a 14 combo average thanks skyfall. This is basically just an Ilm check or Diablos/Anubis thing. Vaedriel and xer 21 like this. Anubis / Zuoh / Haku x3 / Diablos...don't want to strategize anything better. Two runs and best was 20%. I'm fine with that. I don't really like/care about these stam/stone sink challenges. No idea if this will hold up or not but I don't care about this account so I'll take it and get out now so I can avoid spending stones on this. Nachtmacher, chiubag, tanpopo and 6 others like this. 7.1% one second try, runs afterwards trying different builds. Will TRY to just use natural stamina on this one. First run, blind, comboing like there's no tomorrow. I would say I performed decently but it's far from enough. I'm pretty surprised to see that I've been pushed upwards since the moment I did that run. I expected to drop like a rock, but instead my ranking just raised by almost 1%, so yeah, I take it. I'll probably go the 7*6 route anyway, but still, this was a decent run. EDIT : Woops, my images are too big, I'll resize them in a minute. 140,500 (4%) with an Ilm/Ilm/NY Leilan/Saria/Ilmina, not fully casino because I still feel the need to actively combo a little and that was not a perfect run (I got skill bound on the last floor because I had no friends with L/R up so I was rolling with R/L) might have to evo my own floof to R/L since there are plenty of Ilms on my friend list. First time trying this sort of team on ranking dungeon and it's NASTY. Ate the one stone from completing it in refreshes. This is the best I can do so far. I'm gonna try more with natural stam since I hate spending on stam. One of these times maybe I'll get lucky. I swear 95% of the time I made a 7 combo it fell flat and ruined a perfectly good run. I was getting very aggravated with the skyfalls cause make an 8 and I can fall to a 16 and ruin your time as well. There's a sweet spot in there but skyfalls have no mercy either way. I'd probably be faster on an iPhone then an iPad but I prefer iPad outside of ranking for easy diagnols.